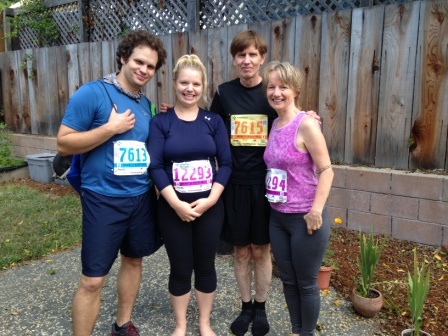 I recently ran in a 6-mile race in Santa Cruz with my husband, daughter, and son-in-law. I usually jog more than run, so I didn’t even try to keep up with my husband, who is a marathon runner. Luckily, my daughter and I were pretty evenly matched in pace so we kept each other going. The great thing about running in an organized race or with a buddy is that I almost always go farther and last longer than when I am by myself. Six miles is definitely more than my regular exercise routine. Preparing for and during the race, I experimented with doing almost exclusively yogic diaphragmatic nasal breathing while running. Keeping the breath passing through the nose encourages the nervous system to stay in the calmer, parasympathetic mode rather than the fight-or-flight sympathetic stress response of chest and mouth breathing. With this breathing technique, the energy of the event, my daughter beside me, and the lovely oceanside route, it was quite an enjoyable experience. I am looking forward to our upcoming Ananda Holistic Health Retreat in September where we take participants on an “affirmation walk” each morning. We will be using Yogananda’s recommendation to inhale through the nose, hold the breath, and then exhale to an equal count as you walk. When you also add in a silent, positive affirmation, supportive walking partners, and the wonders of nature at Ananda Village, you have a very effective, calm and yet invigorating way to exercise.